This picture is the most current. I’ve moved the shock attachment point which raises the seat height and lowers the BB. Yesterday I put 25 miles on the bike and it does well on the comfort side but still quick steering. The quick steering may be me and not the bike. Maybe that is just the way SWB bikes are. I can go very slow, but I have to pay attention. I hit 30 mph a couple of times yesterday which is as fast as this old man cares to go anymore. At higher speeds it rides very straight. I still want a suspended fork for the front. This will change the head tube to about 72 degrees which I think will improve the low speed handling. The following is old information and pictures. I brought the Suspended Spirit home today. Last week we could not finish the bike while I was my sons house because we didn’t make it to the bike shop before it closed to get a few parts. Today I went back to Plano and we picked up the parts and did a test ride of the bike. All went well. I’ll trim out a new seat for it tomorrow, take and post some build pictures and ride it for a couple of weeks before painting. David has completed the build on the MBB he has been working on. I don’t know if it is just experience or it just worked out this way, but I think these are the two best bikes we’ve built to date. For now the Suspended Spirit has rear suspension only. These are early photos. Build information to follow soon. I took a fall a few days ago and have been off my feet since then. This morning I was feeling better and we have cooler weather, so I cobbled together another seat and took the bike for another ride. 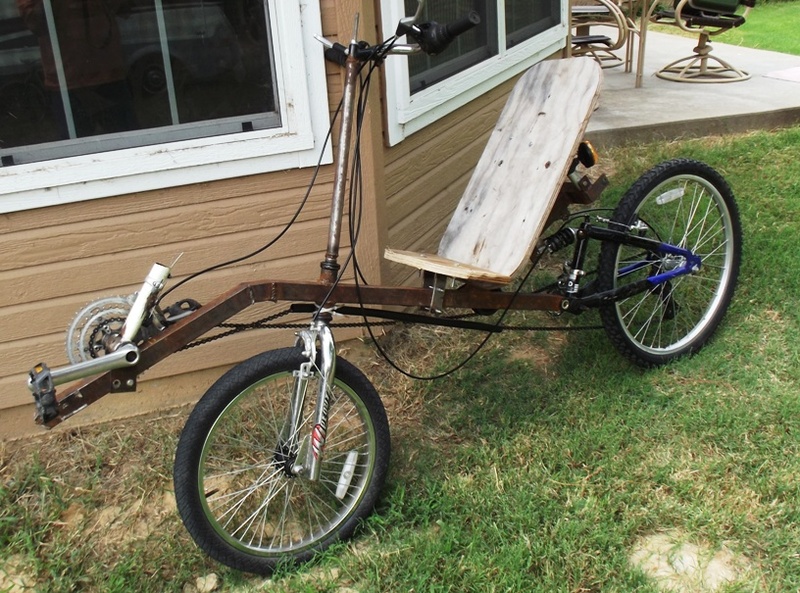 I have tried the Barnett Williams style fabric seat and it is too wide for this bike although it is great on my trike. I really wanted to use the curved plywood seat but just found it uncomfortable in the upright position that I have on this bike. So I just put together a plywood right angle seat and it works find. I just have to find a way to make it look cool. 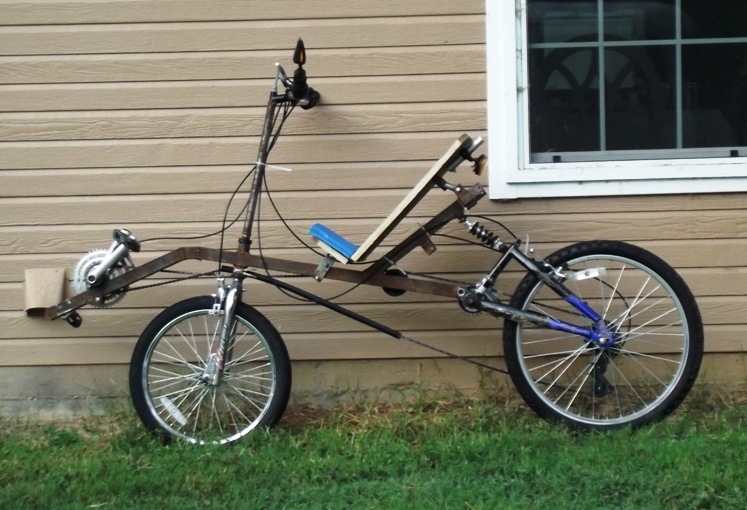 I am satisfied now that the bike has pretty much the handling characteristics that I expect from a short wheel base recumbent and can now take a few days to tear it down and paint, reroute cables, etc. This is the head tube that we placed in the main boom. Putting an 1 1/2 inch head tube into 1 1/2 square tubing is a bit of a trick but David pulled it off. He used an 1 1/2 inch hole saw on each side of the tubing being careful to make sure the hole on each side lined up. He then took a hammer and persuaded the sides of the square tubing out enough to get the head tube started then drove it home with a hammer. To his surprise it came out perfectly square. A couple of welds and it was a done deal. We didn’t think about it at the time, but if we had not driven it through so far it would have lowered the front of the main boom by an 1 1/2 inches or so. You know what they say about hind site. We had originally planned on a suspended front fork but could not find a suitable donor. I am pleased with the ride with only rear suspension so I think I will leave the bike as it is. 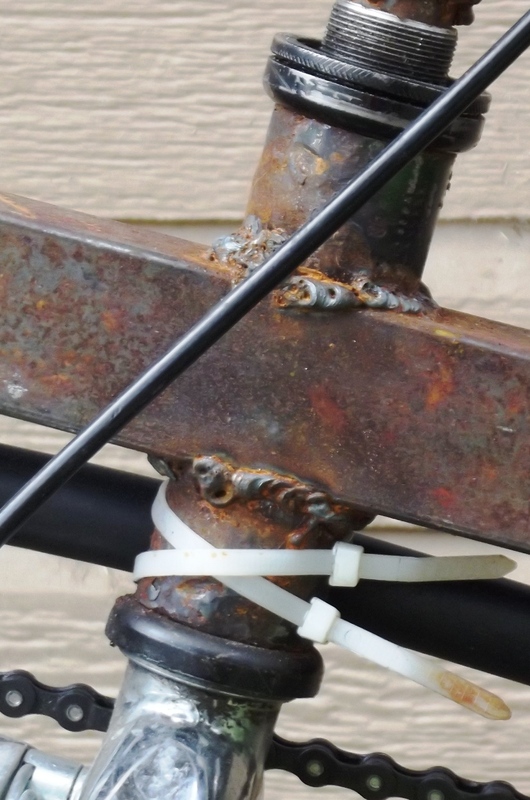 We used the rear suspension and rear triangle from a mountain bike with 24 inch wheels. I wanted to keep the 24 inch wheel for the lower gearing. This morning I took the bike up the steepest hill on my normal route and found the gearing to be about right. Any slower and I couldn’t keep the bike in a straight line. As you can see, we cut the cranks and all but one of the chain rings from the original bottom bracket to use for chain management. It almost is not needed. 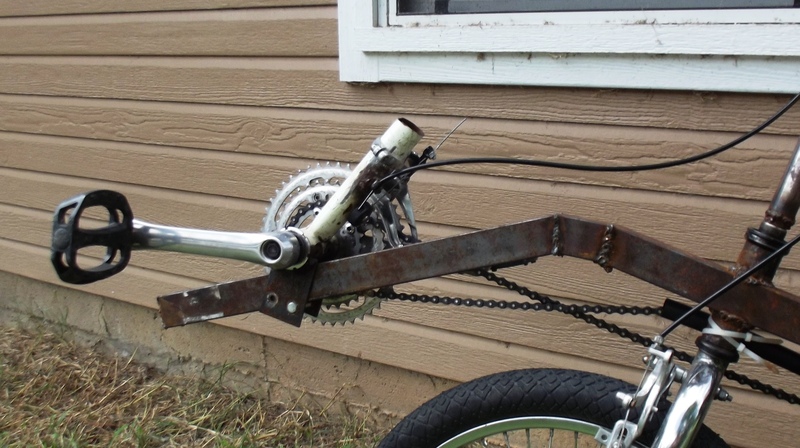 We also put a front derailleur to hold the chain in place. It worked out very well. One of my objectives with the bike was to keep the wheelbase as short as possible but have some ride comfort not found in some of the SWB bikes I see. I wanted a high seat position and low BB . I was trying to emulate some of the qualities of a SWB and LWB. I am fairly happy that we met these goals. I cannot lower the BB any further because of heel strike. I think I can save several pound by removing the about a foot of the main boom in the front and removing the seat stay completely. I can then attach the shock directly to the main boom and use aluminum tubes to the main boom as seat stays. David supplied me with a 100 psi front tire. I still need to pickup a 100 psi tire for the rear. That’s something I don’t think I could do without the rear suspension. So far I am pleased with our efforts. I am seriously considering doing something similar to what you are. I have some differences in design in mind. I really don’t seem to be able to find a recumbent full suspension bike, seems like there are so few. Granted, most probably feel it is unnecessary, and honestly I’ve never been on a recumbent with full suspension (only recumbent I’ve ever been on is the one I own, vision R42). However, I am sure it’ll make the ride a tiny bit nicer at least. 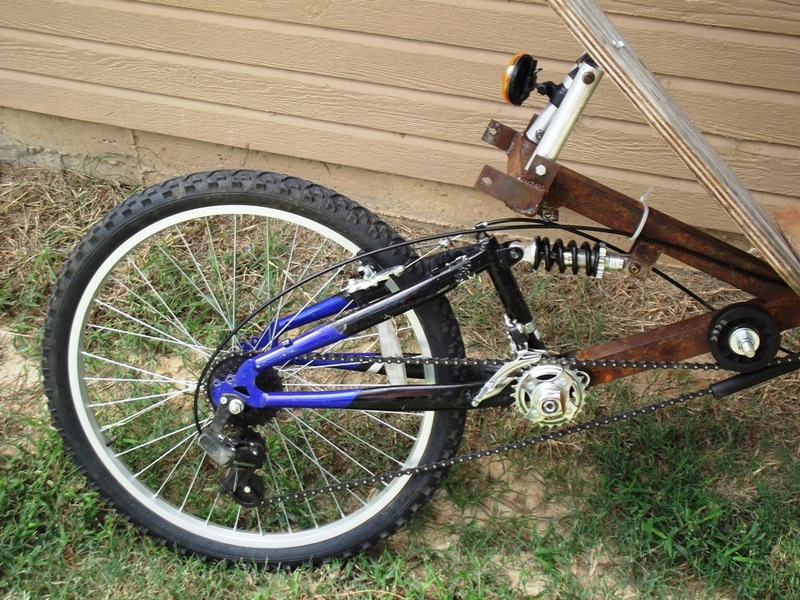 I’ve found a few full suspension recumbent trikes, but they are surely expensive. I’ve made more changes since the pictures now displayed. I now have it disassembled and getting ready to paint and put on a new seat. I have an R 40 and can compare to it. It is a smooth ride even with rear suspension only. It was my favorite ride until I bought the Vision R 40. The problem, the suspended bike is heavy. It may be 10 lbs heavier than the R40. But it rides great if you don’t have a lot of uphills. Here is one of the best home brews I have seen. Here si a link to the build on Atomic Zombie.